Objective: To establish a classification of bicuspid aortic valve (BAV) that includes both leaflet morphology and aortic shape. Setting: Two academic medical centres of the University of Washington, Seattle. Patients: 191 adult patients with BAV. Interventions: Review of clinical data and transthoracic echocardiograms. Main outcome measures: Assessment of leaflet morphology; valve function; aortic shape and dimensions. Results: We identified three morphologies: type 1, fusion of right and left coronary cusp (n = 152); type 2, right and non-coronary fusion (n = 39); and type 3, left and non-coronary fusion (n = 1). Comparing type 1 and 2 BAV, there were no significant differences in age, height, weight, blood pressure or aortic valve function. Type 1 was more common in men (69 vs 45%). The aortic sinuses were larger in type 1, while type 2 had larger arch dimensions. Myxomatous mitral valves were more common in type 2 BAV (13% vs 2.6%, p<0.05). Three aortic shapes were defined: normal (N), sinus effacement (E), and ascending dilatation (A). Comparing type 1 to type 2 BAV, shape N was more common in type 1 (60% vs 32%), and type A was more common in type 2 (35% vs 54%,); type E was rare (p<0.01 across all groups). Conclusion: A comprehensive BAV phenotype includes aortic shape. Type 1 BAV is associated with male gender and normal aortic shape but a larger sinus diameter. Type 2 leaflet morphology is associated with ascending aorta dilatation , larger arch dimensions and higher prevalence of myxomatous mitral valve disease. However, there is marked variability in the phenotypic presentation of BAV; there is non-uniform valve morphology,15 16 a wide age range of valve dysfunction that becomes clinically evident between infancy and old age and the development of aortic dilatation only in some individuals. Our long-term goal is to determine if the differing phenotypic presentations in BAV patients might be the result of more than one genetic or developmental cause. The purpose of the current study was to develop an accurate phenotypic classification of BAV and aortic root morphology. Although different valve morphologies have been described, there are no previous studies that incorporate both valve and aortic root anatomy in a single phenotypic classification that can be used in future genetic studies. The institutional review board of the Children’s Hospital and Regional Medical Center, University of Washington, Seattle, Washington, approved this study as part of the project “Echocardiography of Genetic Heart Disease”. We retrospectively identified 226 patients with BAV who underwent echocardiography at the University of Washington Medical Center and Harborview Medical Center (both Seattle, WA, USA) between 1 January 2002 and 31 December 2004 and had neither an aortic valve replacement nor Turner syndrome. Indications for echocardiography were available for 184 subjects. BAV, aortic valve dysfunction and murmur were indications in 82 (45%), 27 (15%) and 11 (6%), respectively. The diagnosis of BAV was verified by image review by one investigator (BMS) with review by a second investigator (CMO) when the echo report was discrepant with the image review. If the presence of BAV could not be confirmed or images could not be retrieved, cases were excluded (n = 12). Other predefined exclusion criteria were aortic valvuloplasty (n = 2), aortic root surgery (n = 1), heart transplant (n = 3), complex congenital heart disease (except for coarctation) or a known genetic syndrome (n = 11), severe systolic dysfunction or cardiomyopathy that would interfere with measurements of aortic valve function (n = 3), known aortic aneurysm as defined by a diameter greater than 5 cm (n = 2) and aortic or mitral valve endocarditis (n = 2). This left a total of 186 patients in the study group. Six additional BAV patients were identified as part of a prospective arm of the project, which recruited patients undergoing echocardiography after the closing date of the retrospective study and relatives of BAV subjects. Exclusion criteria were identical. Thus, the total number of BAV patients was 192 (186 retrospective plus six prospective). Patient gender, age, blood pressure, heart rate, weight, height, body surface area and primary indication at the time of the echo were extracted from echo reports. Prospective subjects gave this information at the time of their examination. Type 3 when there was congenital fusion of the non-coronary and left coronary cusp. The presence or absence of a raphe, or area of thickening in the area of congenital leaflet fusion was noted but not counted as an important distinguishing feature, as it may be missed on transthoracic echocardiography. Valve calcification was assessed on a semi-quantitative scale according to the location and extent of nodular, dense deposits by echocardiography (fig 1). Aortic stenosis was defined as moderate to severe when aortic jet velocity exceeded 300 cm/s. Figure 1 Calcification score. A semi-quantitative score was devised to assess valve calcification. Top row, parasternal long axis view; bottom row, parasternal short axis view of the aortic valve. The arrows point out foci of calcification. Definitions are as follows: 0, no calcification; 1+ (minimal), “speckles”; 2+ (mild), nodule involving one leaflet; 3+ (moderate), two or more nodules involving two cusps (in trileaflet valves, two or three cusps); 4 + (severe), diffuse confluent calcification involving all leaflets. Figure 2 Aortic shapes. Schematic of three aortic shapes that are all inclusive. Dsinus, diameter at the sinus of Valsalva; DSTJ, diameter at the sinotubular junction; Dasc, diameter in the mid ascending aorta. These definitions ensured that all subjects were classifiable, provided dimension measurements were available (181 of 192, 94%). Aortic and mitral regurgitation were graded as none, mild or moderate to severe based on a combination of colour Doppler vena contracta width and jet area and the continuous wave Doppler signal based on American Society of Echocardiography recommendations.17 Myxomatous mitral valve disease was diagnosed when there was prolapse of either leaflet, abnormal chordal or leaflet thickening or redundancy of the chordal apparatus. Ejection fraction was measured by the apical biplane approach in 142 subjects (74%) and by visual estimation when endocardial definition was suboptimal in the remainder as ⩽20%, 21–30%, 31–40%, 41–50%, 51–55%, 56–65% and >65%. Limited echocardiography on prospective subjects was performed by an experienced echocardiographer using a hand-carried ultrasound device with a 3–5 MHz phased array (MicroMaxx, Sonosite, Bothell, WA, USA). The study focused on aortic and mitral valve morphology and function, chamber dimensions, visual estimation of ventricular function, aortic dimensions and exclusion of aortic coarctation. All data were analysed using JMP 6.0 for Macintosh (SAS Institute, Cary, NC, USA). For continuous variables, Student t test/ANOVA and the Wilcoxon/Kruskal Wallis methods were used for single/multiple variables with normal and non-normal distribution, respectively. Categorical variables were compared using Fisher’s exact test and χ2 statistics, as appropriate. Unless noted otherwise, values represent mean (SD), median (maximum − minimum). Box plots represent median, 25% and 75% percentile with whiskers at the minimum and maximum. Type 1 (anterior-posterior) leaflet morphology was present in 79.6% of our subjects (table 1 and fig 3). Type 3 was seen in only one case and thus was not considered in further analysis. Type 2 BAV subjects had significantly higher frequency of myxomatous valve disease. Figure 3 Bicuspid aortic valve leaflet morphology. Schematic of BAV phenotypes as seen from a parasternal short axis view on echocardiography. Small inset top left depicts a normal aortic valve in the same orientation with right coronary cusp (RC), left coronary cusp (LC), non-coronary cusp (NC), right coronary artery (RCA) and left coronary artery (LCA). 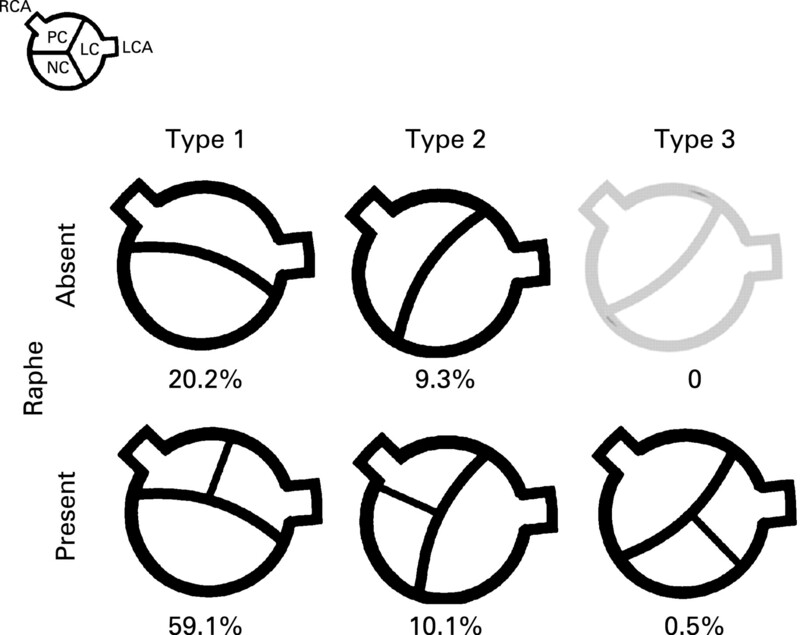 Valve phenotypes and their frequencies are shown: type 1, “fusion” between right and left coronary cusp; type 2, “fusion” between right and non-coronary cusp; type 3, “fusion” between left and non-coronary cusp. Top row, without a raphe; bottom row with raphe. Type 3 with without a raphe was not seen in our study group. Numbers indicate the observed frequency in our cohort. Valve dysfunction was common, with regurgitation being the predominant abnormality. Out of 191 subjects, 11 (5.8%) had combined moderate or severe regurgitation and stenosis and 21 (11%) had completely normal aortic valve function. Four out of nine subjects with myxomatous valve disease had more than mild mitral regurgitation. Male gender predominated among subjects; however type 2 BAV subjects were notably more often female, Although statistical significance was not found, the male to female ratio for type 1 was 2.7:1 and for type 2 was 1.3:1. Ejection fraction was reduced (defined as less than 50% by visual estimation or biplane measurement) in 12%. Myxomatous mitral valve disease was more common with type 2 than type I BAV. There were no significant differences between type 1 and type 2 for age, left ventricular function, body size, blood pressure, valve calcification, presence of aortic coarctation or the severity of valve dysfunction (table 1). The most prevalent aortic anatomy was shape N, both overall and among type 1 BAV. Shape A was less common, and mainly seen in subjects with type 2 BAV. Shape E was the least common. 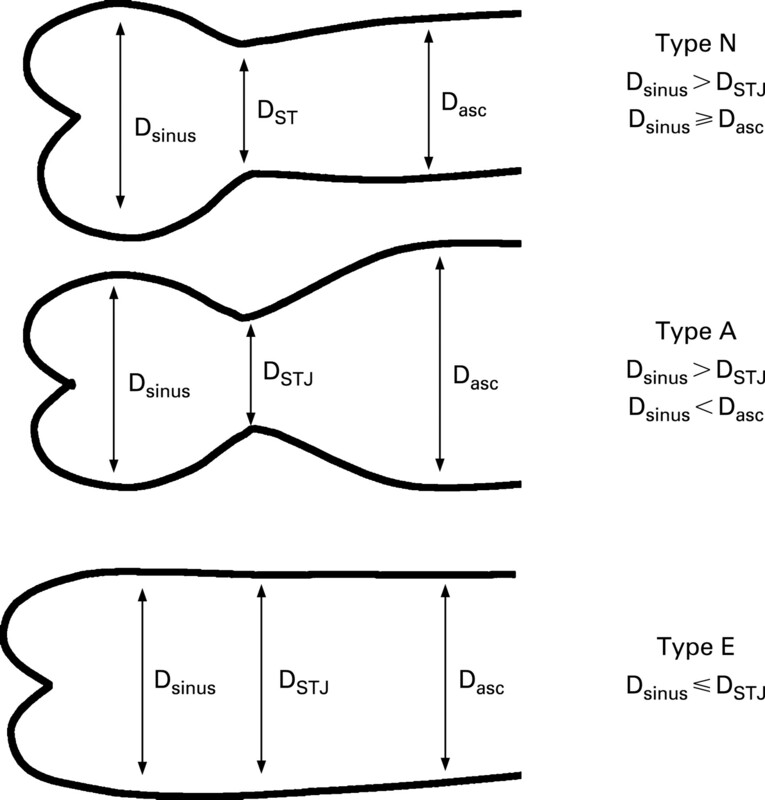 In addition to aortic shape, there were significant size differences between type 1 and type 2 BAV (table 2). The aortic annulus and sinus of Valsalva were significantly larger in type 1. This relation reversed for the aortic arch, however it missed statistical significance (p = 0.11). No difference was seen at the sinotubular junction or ascending aorta (table 3). Correlation between aortic shape and age was not found. While the male to female ratio was identical for type A and type E, 1.6:1, it was 3.9:1 for type N (p = 0.03). When leaflet morphology type (number) and aortic shape (letter) are combined into a phenotypic classification, ascending aortic dilatation (>3.6 cm) was seen in 31 of 50 (62%) of type 1A, 10 of 20 (50%) of type 2A and 11 of 86 (13%) of type 1N (fig 4). Overall, five of 13 (38%) BAV with type E had ascending aorta dilatation (one type 2, four type 1). Type 1A has the highest frequency, while all type 2N subjects have normal ascending aortic size. This difference was highly significant (p<0.001 for comparison across groups). Figure 4 Aortic dilatation by bicuspid aortic valve type and aortic shape. Incidence of ascending aortic dilatation, as determined by an aortic diameter greater than 3.6 cm (black bars) or an indexed diameter greater than 2.1 cm/m2 (grey bars) for various combinations of BAV (1 and 2) phenotype and aortic shape (A, E and N). There were no significant differences in valve dysfunction when BAV and aortic type were considered together. 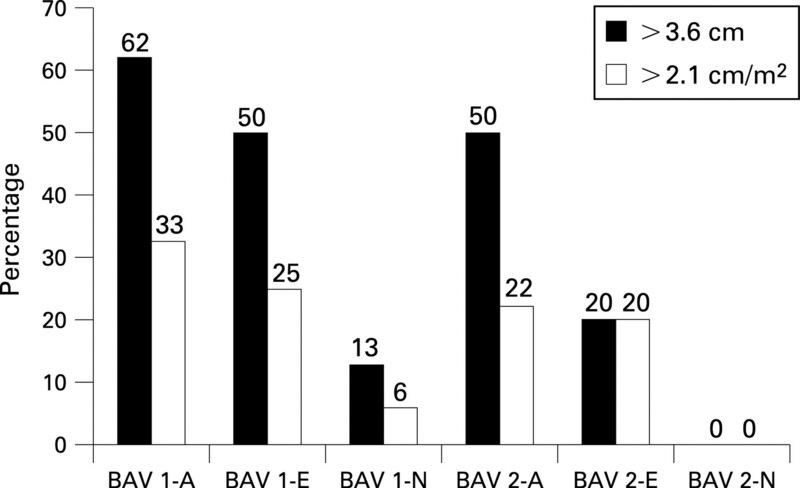 Two-thirds (eight of 12) of type 2N BAV had grade 2+ or more valve calcification, whereas all other subgroups had less than 50%: 1A, 23 of 50 (46%); 1E, 3 of 8 (38%); 1N, 27 of 86 (31%); 2A, 7 of 20 (35%); and 2E, 1 of 4 (20%). Although it is recognised that BAV is associated with variable patterns of leaflet fusion and with aortic root disease, there are no previous phenotypic definitions that incorporate both valve and aortic morphology into a single classification system as described in the current study. As these developmental considerations suggest, aortic disease is typical in subjects with a BAV, with a pattern aortic dilatation that differs from that seen Marfan syndrome.21 25 26 Progressive aortic dilatation occurs in many patients, despite normal valve function.6 27 28 BAV also is associated with aortic coarctation and with an increased risk of aortic dissection. However, it is not possible to predict who will progress to aortic dilatation or if family members of patients with BAV with trileaflet valves are prone to develop aortic pathology. In addition, controversy exists on how to define a normal aortic diameter. Current guidelines describe a formula based on age and body surface area for the aortic root, but there is considerable variation, especially in older adults,29 and there is no uniformity in the timing of measurements relative to the cardiac cycle. Further, to our knowledge, no study to date of aortic involvement in patients with BAV has included descriptors of aortic shape. Our observations led us to devise a phenotypic classification for BAV that includes aortic shape as well as leaflet morphology. Our proposed classification uses a number (1, 2, or 3) for leaflet orientation and a letter (N, A or E) for the shape of the aortic root. Three aortic shapes were defined: normal (N), sinus effacement (E) and ascending dilatation (A). Comparing type 1 to type 2 BAV, type I is associated with male gender and normal (type N) aortic shape (57% vs 31%) but a larger diameter at the sinuses of Valsalva. Type 2 was associated with ascending aortic dilatation (type A, 33% vs 51%), larger arch dimensions and an higher prevalence of myxomatous mitral valve disease. While transthoracic echocardiography cannot visualise the entire ascending aorta and thus the maximal diameter may lie beyond the 4 cm mark, the near identical diameter of the ascending aorta in type 1 and type 2 BAV make it unlikely that more definite methods such as computed tomography or magnetic resonance imaging would have shown significant differences between the groups. These differences in aortic shape may indicate differences in development and tissue composition or the effects of haemodynamics. It likely that the orientation of the opening of a BAV results in different three-dimensional jet shapes between BAV types. In turn, jet shape may lead to differential distribution of wall stress and subsequent remodelling of the vessel wall. This hypothesis is supported by the fact that the type 2 BAV group had proportionally more subjects with significant aortic stenosis, possibly contributing to local dilatation, although our sample did not demonstrate a statistical significance for this association. However there was also a higher prevalence of myxomatous valve disease, suggesting a possible more generalised tissue abnormality. Confirmation of either possibility would have to come from studies in unrelated individuals.
. The congenitally bicuspid aortic valve. A study of 85 autopsy cases. Am J Cardiol 1970;26:72–83.
. An echocardiographic survey of primary school children for bicuspid aortic valve. Am J Cardiol 2004;93:661–3.
. Frequency of bicuspid aortic valve in young male conscripts by echocardiogram. Am J Cardiol 2005;96:718–21.
. Frequency by decades of unicuspid, bicuspid, and tricuspid aortic valves in adults having isolated aortic valve replacement for aortic stenosis, with or without associated aortic regurgitation. Circulation 2005;111:920–5.
. Frequency of aortic root dilation in children with a bicuspid aortic valve. Am J Cardiol 2004;94:1337–40.
. Changes in size of ascending aorta and aortic valve function with time in patients with congenitally bicuspid aortic valves. Am J Cardiol 2003;92:43–6.
. Risk factors for aortic dissection: a necropsy study of 161 cases. Am J Cardiol 1984;53:849–55.
. Echocardiographic anatomy of ascending aorta dilatation: correlations with aortic valve morphology and function. Int J Cardiol 2006;113:320–6.
. Usefulness of bicuspid aortic valve phenotype to predict elastic properties of the ascending aorta. Am J Cardiol 2007;99:686–90.
. Molecular genetics of aortic valve disease. Curr Opin Cardiol 2006;21:180–4.
. A prospective study to assess the frequency of familial clustering of congenital bicuspid aortic valve. J Am Coll Cardiol 1997;30:1809–12.
. Bicuspid aortic valve is heritable. Curr Cardiol Rep 2005;7:38.
. Cardiovascular malformations and complications in Turner syndrome. Pediatrics 1998;101:E11.
. Congenital bicuspid aortic valves associated with coarctation of the aorta in children. Br Heart J 1969;31:127–8.
. Congenitally bicuspid aortic valves: a surgical pathology study of 542 cases (1991 through 1996) and a literature review of 2,715 additional cases. Mayo Clin Proc 1999;74:14–26.
. Morphology of bicuspid aortic valve in children and adolescents. J Am Coll Cardiol 2004;44:1648–51.
. Recommendations for evaluation of the severity of native valvular regurgitation with two-dimensional and Doppler echocardiography. J Am Soc Echocardiogr 2003;16:777–802.
. Bicuspid aortic valve is heritable. J Am Coll Cardiol 2004;44:138–43.
. A locus for autosomal dominant mitral valve prolapse on chromosome 11p15.4. Am J Hum Genet 2003;72:1551–9.
. New locus for autosomal dominant mitral valve prolapse on chromosome 13: clinical insights from genetic studies. Circulation 2005;112:2022–30.
. Predictors of ascending aortic dilatation with bicuspid aortic valve: a wide spectrum of disease expression. Eur J Cardiothorac Surg 2007;31:397–405.
. Mutations in NOTCH1 cause aortic valve disease. Nature 2005;437:270–4.
. Fate of the mammalian cardiac neural crest. Development 2000;127:1607–16.
. Ablation of specific expression domains reveals discrete functions of ectoderm- and endoderm-derived FGF8 during cardiovascular and pharyngeal development. Development 2003;130:6361–74.
. Configuration of the ascending aorta in patients with bicuspid and tricuspid aortic valve disease undergoing aortic valve replacement with or without reduction aortoplasty. J Heart Valve Dis 2006;15:594–600.
. Comparison of the pattern of aortic dilation in children with the Marfan’s syndrome versus children with a bicuspid aortic valve. Am J Cardiol 2006;98:1094–5.
. Aortic dimensions in patients with bicuspid aortic valve without significant valve dysfunction. Am J Cardiol 2005;95:292–4.
. Progression of aortic dilation in children with a functionally normal bicuspid aortic valve. Am J Cardiol 2006;98:828–30.
. Two-dimensional echocardiographic aortic root dimensions in normal children and adults. Am J Cardiol 1989;64:507–12. Funding: Supported by a fellowship grant from the ACCF/Merck Fellowship (ACC, Bethesda, MD, USA) and by the Seattle Foundation (Seattle, WA, USA).